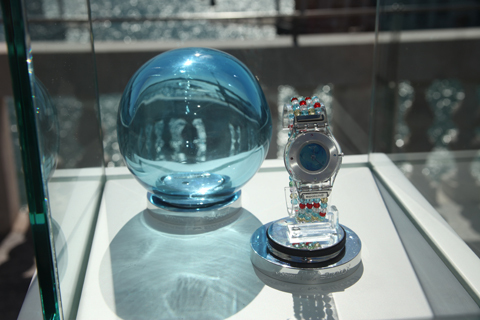 I was invited to Venice for the launch of two new Swatch watches created by French artist Jean-Michel Othoniel, best known for his stunning work in Murano glass. 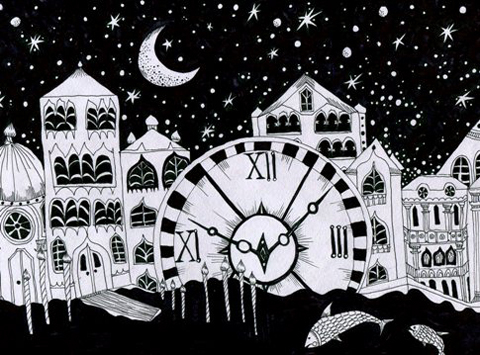 Get the low down on his new designs here. Jean-Michel Othoniel Over the Rainbow Swatch by Catherine Stone. 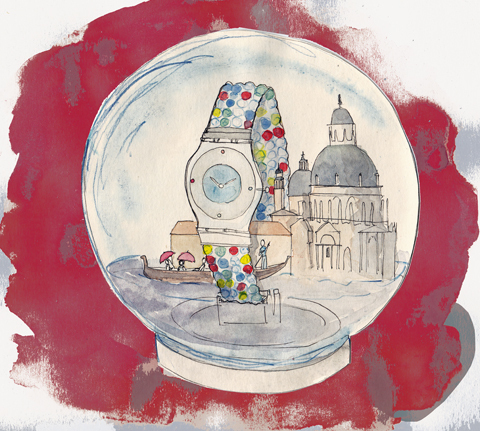 Last week I was invited to Venice to find out about the newest Swatch watch: created by the artist Jean-Michel Othoniel. 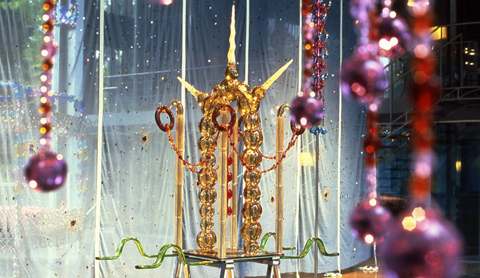 Swatch fell in love with his decorative use of Murano glass in incredible jewelled artworks that began life for an exhibition at the Peggy Guggenheim gallery in Venice itself. Jean-Michel was told there was no official space in which he was able to showcase artworks due to strict instructions left in Peggy Guggenheim‘s will, viagra but looking around he wondered whether the branches of a tree in the gallery courtyard could be exempt from this rule and his aerial bound sculptures began to take shape. 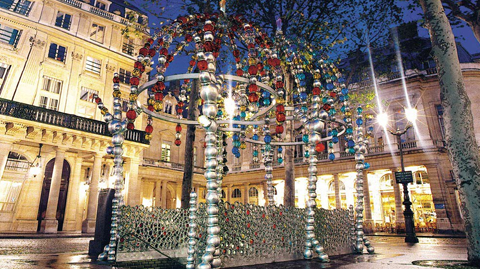 Jean-Michel Othoniel draped strung baubles in the tree at the Guggenheim and the rest, as they say, is history. He has continued to work in the same way using all the colours of the Murano glass rainbow to create ethereal installations more akin to giant jewellery than art. 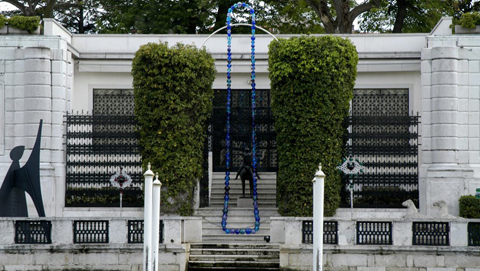 Some of Jean-Michel Othoniel‘s art, including the necklace draped over the Guggenheim Venice. 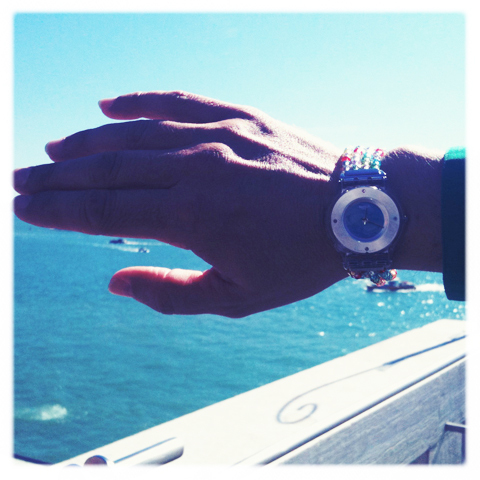 Jean-Michel Othoniel showcases his Over the Rainbow watch. 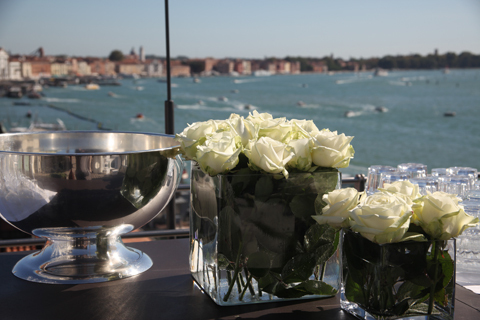 On the glorious sunny rooftop of the Biennale building in Venice the soft spoken artist described how pleased he was to be asked to create a little piece of art that will be available to lots of people. 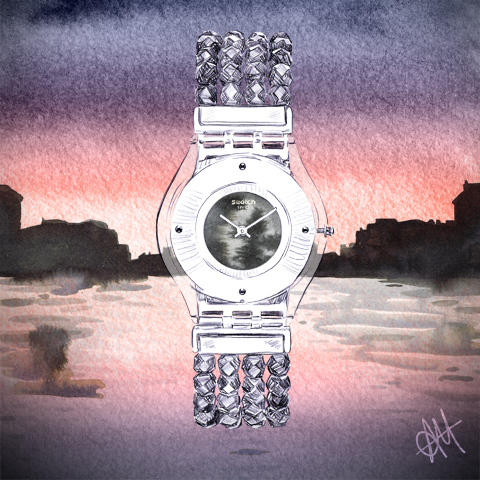 Ever the romantic he hopes that wearing one of his watches will offer the wearer that bit of otherworldly magic and wonder that he aims for in his sculptures. 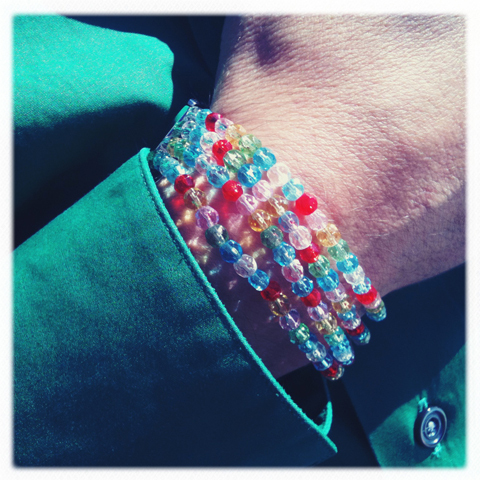 He described how using Murano glass within the design was key, because the beads look like beautiful precious stones. I can certainly appreciate this in the sparkling Murano beads of the colourful Over the Rainbow limited edition version which is slightly oversized so that it can be worn on the wrist the wrong way round – as Jean-Michel demonstrated this to me I was most taken (as a non watch wearer myself) with the idea of wearing a private timepiece which on the exterior just looks like a pretty bracelet. It comes presented in a beautiful blown glass bubble – difficult to achieve but an absolute necessity for Jean-Michel Othoniel, who conceives his watch as art. The Be Black version sports slightly bigger and more manly black beads with a clasp, though both are unisex watches. SWATCH in Venice. Jean-Michel Othoniel‘s Be Black by Abi Heyneke. 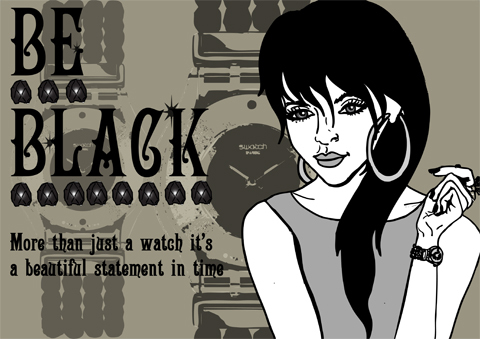 Swatch Be Black by Laura Godfrey. 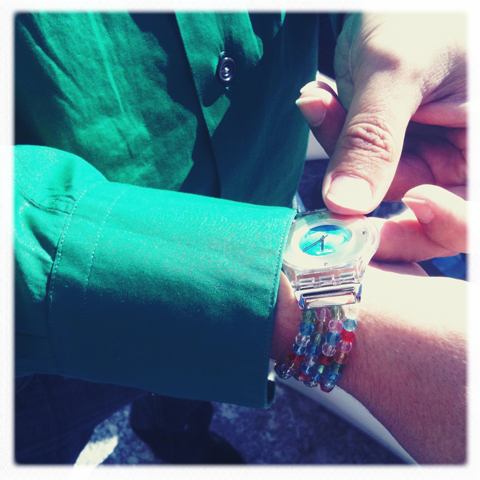 Swatch president Madame Emch wears Jean-Michel Othoniel’s Be Black watch. 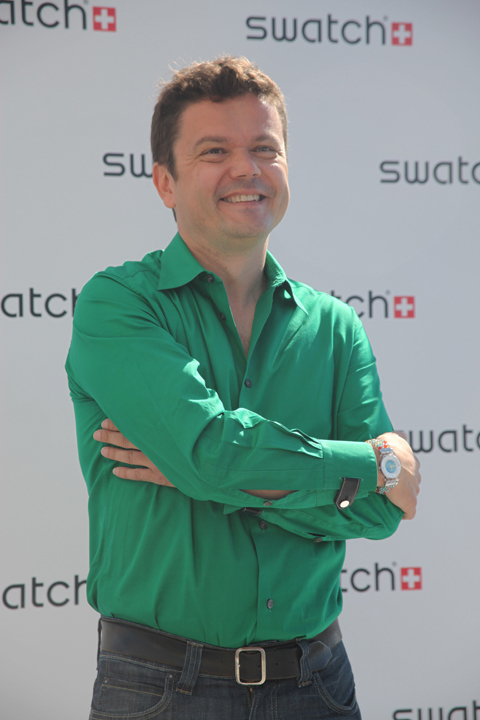 Even though the watches (which use the Swatch Skin model as a base) cost a very reasonable £190.50 for Over the Rainbow and £76 for Be Black, both Swatch and Jean-Michel very much hope that these will be more than throwaway watches – instead they are designed to become fetishistic charms, reminders of the need for fantasy and fairytales. Sound far-fetched? 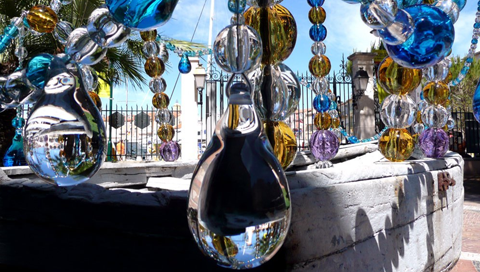 With the light glinting gleefully off the Murano beads in the Venice sunshine, a world of enchantment doesn’t seem that far away.